Geranium macrorrhizum ‘De Bilt’ a low growing ground cover plant for shade. This is an evergreen ground cover plant and Geranium macrorrhizum ‘De Bilt’ with its magenta to pink flowers is easy to grow. A mound forming plant, it grows well in full sun to part shade. It is frost hardy, and once established is regarded as drought tolerant. Usually reaching less than 30 cm in height, like most of the macrorrhizum group this is a naturally neat plant. Scented foliage has a slight touch of coconut to the fragrance. Plant Geranium macrorrhizum ‘De Bilt’ in a position where it receives protection from afternoon sun in summer. Good sun in winter is beneficial so perhaps a position beneath a deciduous tree is well suited. Dig over the soil well and add some compost and aged cow manure before planting. Water in with seaweed fertiliser. Some additional water through dry periods in the first summer will be beneficial. Lightly mulch around the plant to maintain a cool moist root run. This is also a suitable plant to grow in containers. Use a good quality potting mix, and water with a liquid seaweed fertiliser. 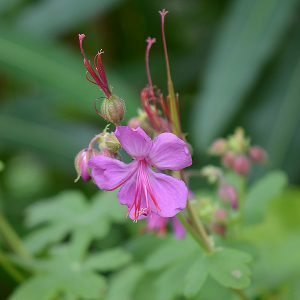 Geranium macrorrhizum ‘De Bilt’ is available for sale from the following nurseries.